If you asked me just a year ago, I would have never thought I’d go to medical school in the Caribbean. Throughout my pre-medical years, particularly the first year, I have often heard fellow classmates call Caribbean med schools the “last resort” and scoff that students who attend these schools are substandard, and therefore become substandard doctor. These thoughts sunk in me as I too have passed the hallways of the Biological Sciences building and see posters of some schools that claim that an MCAT is not needed to apply. Without much thought, I assumed this was how all Caribbean schools were, and I put them in the back of my application priority list as “last resort.” This was how things were in my mind until the past year. I originally applied early decision to the Medical College of Georgia (MCG) in Augusta, Georgia. In hindsight, my decision was one of convenience rather than true interest. It was close to family and my girlfriend, and as I was a resident of Georgia, the in-state tuition is cheap. Augusta has one of the largest medical districts in the South, and I figured MCG students basically have access to it all. In short, I thought MCG was a good deal. I never really looked at other schools, because just the location and tuition alone was enough to convince me to go. My pre-med adviser believed I had a good chance to get in as an EDP applicant, although my non-traditional educational history may raise some eyebrows, with my undergraduate degree in architecture and linguistics. Yet, my letters of recommendations were good, and with years of research and volunteering, I felt that I was set. Sure enough, I applied, and got the first interview of the season. I always figured, I could never go wrong in answering honestly. They’d have a better picture of me and I of them, and whether or not I get accepted, it should not be a matter of pride or disappointment, because we were simply matching each other to see if I was what the school was looking for, and vice versa. My interview turned out to be average at best. I was very honest, but the problem was, my thoughts and goals have not progressed beyond mere feelings and speculation. My interview was a wake-up call for me to be more assertive in my opinions, and more rational in my decisions. I was still hopeful, and awaited for news. But by October, I received word that I was deferred to the regular decision pool. I was not too surprised by that point. In a way, I was relieved that my options became open as I started applying for other schools. Out of necessity, I learned more about what I wanted in my medical education, and learned more about myself. By the time I finished many of the school’s applications, however, it was late in the application season, and given the small number of seats, my chances of acceptance were low. By the time spring came and no word from medical schools yet, not even one interview, I was feeling really disappointed in myself, and confused. April came, and still no invitations. I was determined to do things right this time for my new set of Caribbean applications. I deleted my old personal statement that I had used for AMCAS, and started again from a blank page. I suspected the way I had wrote it may have been a weakness in my application, and I completely rewrote it to be much more narrative, unified, and detailed. I also realized I needed more first-hand experience in medicine to have stronger, more specific thoughts about my pursuits. I marched around town, visiting doctors door to door and asked them for shadowing opportunities, handing them my resume. After many rejections, which I was used to already by this time, I never gave up and finally found Dr. Lopez, a pediatrician, who was willing to give me an interview. I did not hesitate and took advantage of this opportunity. I was given the chance to shadow, and did not take any of my time there for granted. I worked hard and learned as much as I could get out of it. I studied more of what I had learned that day whenever I got home, because I knew how much effort it had taken me to find that position. My experience was very hands-on, more than what a typical shadow would do. The medical assistants mentored me and I worked alongside them, triaging patients, administering vaccines, conducting rapid lab tests, interviewing patients, and working with the electronic medical records. Dr. Lopez taught me how to listen to the quadrants, use the otoscope, detect reflexes, and perform percussion. I saw many unique cases and how the entire clinic handled them. The fact that they see 40 to 50 patients a day, of which the majority speak only Spanish, gave me a unique opportunity for cultural learning. The experience was invaluable, and I loved everything about it, and I learned more those six weeks than I ever could in a semester-long class, not just about the practice of medicine but more importantly, my own desires and my abilities. I researched more than I ever did about schools, as I wanted to find a school that I truly liked, and I wanted to make sure the international schools to which I was applying would prepare me the same as I would get at a school in the states. I went to my school’s pre-medical office and looked at the viewbooks, dvds, and reviews they had on Caribbean medical schools, and looked through all the schools. I read ValueMD extensively and sifted through many schools’ websites. Unlike what I had thought before, I learned that not all Caribbean schools are the same, and certainly many are far better than what one would consider “last resorts.” And yes, many do require MCAT and other standards of admissions. There are several that I was actually quite impressed with in terms of facilities, USMLE pass rates, and residency positions obtained by their graduates. I learned about the “Big Four” schools which the U.S. Department of Education have found comparable to American schools, and which graduates can be licensed in all fifty states. Some schools are even found to be so comparable that they are eligible for U.S. Federal loans despite the fact that they are in foreign countries! I found blogs of Caribbean med students who gave me a picture that many students from these schools are far from substandard. Many are very smart, hardworking individuals who never gave up on pursuing their dreams. In fact, many felt compelled to work even harder than the average med student to make up for the fact that they will be seen as an international medical graduate who would be subject to potential biases despite the fact they pass the same licensing exams and train in the same U.S. clerkships. Their blogs helped me get past my superficial fears. Inspired by students like Kendra and Topher, I created this blog as well, to give my perspectives to those who find themselves in the same situation as me not too long ago, or to those who simply pass by and are curious about what my life is like studying medicine in a place people would normally associate with beaches and pina coladas. This coming September, I will be studying at the American University of the Caribbean. After much research, I am confident that I have made the right choice for me. After a long year of applications, rejections, researching, and reapplying, I have ended up gaining a better understanding of myself and with it a stronger determination. This is ultimately what med schools are looking for, and perhaps I never would have gained it without first cycling through the whole range of emotions I went through, from excitement, to disappointment, to fear, to hope, and then to strength as I tried to pursue my dreams. My circumstances have actually turned out to be for the better as I am happier and more excited than ever to start this new phase in my life. In the past I had taken for granted my chance for education, but after being on the verge of losing it, I now hold onto it more than ever. Why the Caribbean? 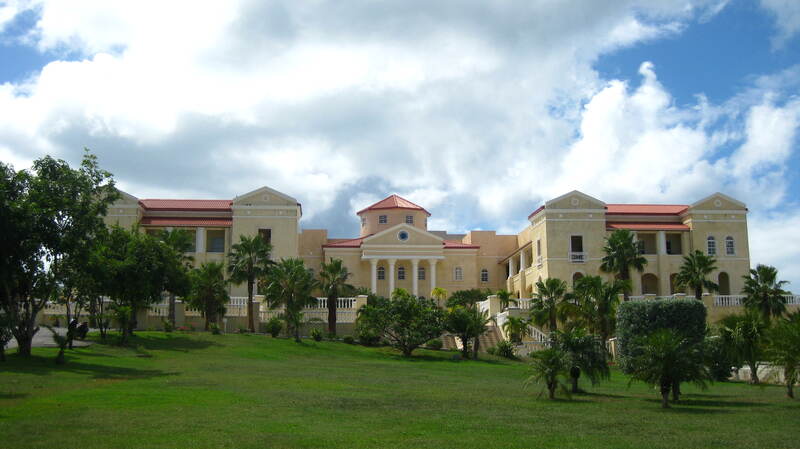 Why the American University of the Caribbean (AUC)? 9 comments to Why am I a Caribbean Med Student? just wondering if you considered reapplying to MD schools or considered DO schools and how they would compare to caribbean schools. thanks for the blog…i’m currently applying this cycle without much luck and am considering the carib but am not sure if i should reapply to both MD and DO or just go to carib….. I am just now reading this, but it is amazing to me how similar of a situation I am in compared to you. I was rejected last year, will be reapplying this year, and have now considered Caribbean medical schools (although some blogs have scared me away from some schools). Thank you for time in helping others learn through this journey! Thanks Amanda! From my experience, I have seen many talented and competent students who end up in the Caribbean for whatever reason, and it’s not just because of scores. Applying to medical schools, many people carry the burden of their pasts, like a bad freshman year or a past event that may have impeded their education. However, I think once we all get into med school, everyone starts from a blank slate again, and we try our best to build a solid new foundation for ourselves and new careers. Best of luck in med school Amanda! I just now started reading your blog as well. I am currently trying to get into med school as well. I have my bachelors in Biology. I am taking orgo 1,2 and retaking physics 1,2. My gpa was only 2.8 and sgpa was 2.6 but will go up once i get A’s in orgo 1,2 physics 1,2. I’m planning on getting a 30 on the MCAT. I also have over 1500 hours of patient experience working as a Medical Assistant in a doctors office. My gpa is low because I had no idea why I was in Biology. I had no sense of direction, not to mention too caught up in partying. BUt after working in a hospital and doctors office I now know I want to be a physician as well. My question is, with a 3.0 GPA and 2.8ish gpa with a 30 on MCAT and 2000+ hours of patient experience with 3 letters of recommendations from physicians I’ve worked with. What are my chances of getting in you think? Also how were you able to have clinicals in the UK and the US? Thanks for reading! I would definitely try shooting higher than 3.0 and 2.8, as those are below average for AUC’s matriculant GPA. 30 MCAT is considered a good score for AUC. However, these numbers are all speculation, and achieving them is a different story. It definitely was for me. So I wish you the best of luck in your classes and exams. As for clinicals, AUC has affiliations with hospitals in both the US and UK and therefore students can rotate in these two countries at the affiliated hospitals. This is a unique opportunity that AUC has that most other med schools may not have. I loved my experience in the UK. Just wanted to take a moment to say ‘thank you’ for sharing your journey through medical school and beyond. Your advice, wisdom, and anecdotes are proof that this journey can be successfully undertaken provided one wants to work and chase their dreams. I will be starting at St. George’s University Academic Enhancement Program in January 2016 and I will be taking a hefty does of your wisdom, particularly pertaining to study habits, with me. Thanks again and I wish you well through your residency training! That is very nice. I wish you the best at SGU! I noticed that besides the “big 4” there are other medical schools with with wonderful accredition all over North America and even some in the UK, India, and Australia. Have you heard of these too? Do you know individuals who have been accepted with a GPA of 2.5, 2.8, 3.0, or 3.2 ? There are many different accreditation bodies that accredit medical schools. However, be very careful when reading what schools list on their “accreditation” page. IMED, FAIMER, WHO, Avicenna, ECFMG, USMLE, and many other fancy acronyms and names that schools like to list as their “accreditation” are NOT accrediting bodies! Many non-big 4 schools are actually unaccredited, and instead list these things to make up for their lack of true accreditation on their webpage.